Winter is usually the refurbishment season at Disneyland, but Disney Theme Parks are probably the only places where palisades means good news. And right now at DLP and the WDS there is quite a lot of palisades! And as we will see it also means good news! First, for those of you who are planning to visit the resort i must admit that i'm a bit exagerating. Palisades are not everywhere in the parks, and some of them will be removed at the end of this month. 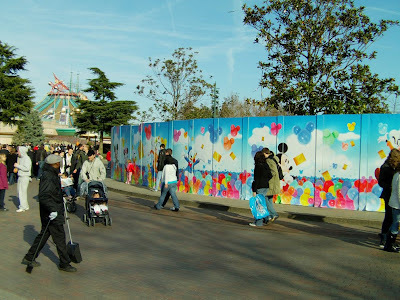 So don't worry, the Disneyland Paris visual pleasure is still there. 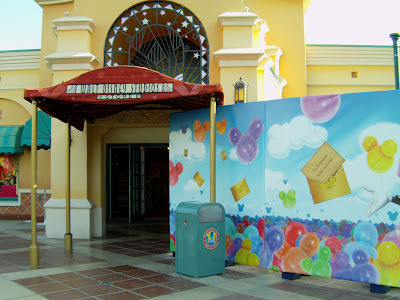 In this same category, the WDS Front Lot shop is also partly surrounded by palisades, also for repainting. 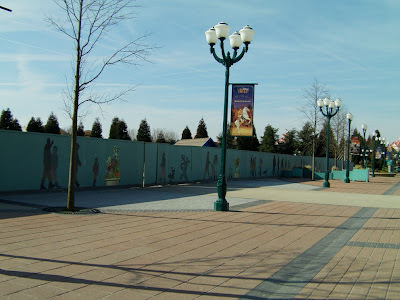 ...where originally they've kept the space to build a huge "World of Disney" store. As you can see on the picture below, they have plenty of room to build it. 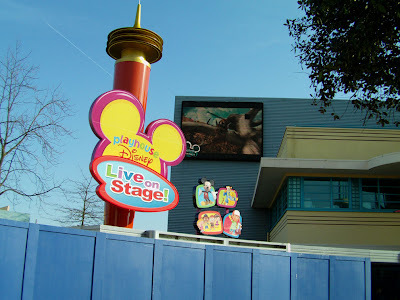 Then you have also another kind of palisades who are hiding the works for new attractions announced officially like this one for the "Playhouse Disney Live on Stage", opening soon, at the end of this month, April 4 at the latest. And then there are others which are the most interesting palisades as they indicate that works for a new attraction NOT announced officially will begin soon. These one are generally the best confirmation a Disney fan can expect. 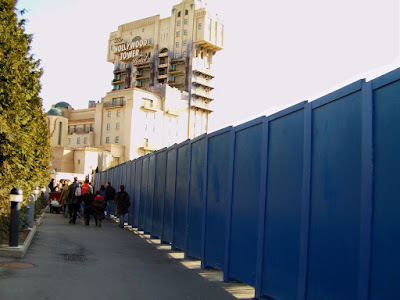 And these palisades surrounding the land which was available between the exit of the Toon Studio and the Tower of Terror confirms that the Toy Story playland project that we've talked before is definitely on its way for a 2010 opening. Here is a previous picture of the land available behind these palisades. ...or along the Tram road. A small part of the little forest will need to be cut down, but the park got the authorisation to do it (they needed it as this wood is normally protected). At the Magic Kingdom guests can also see palisades all around Central Plaza. 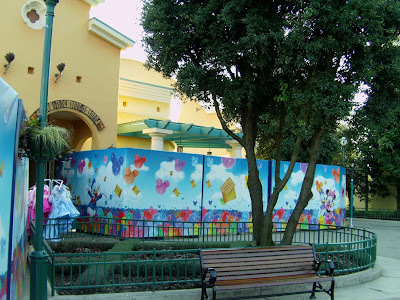 These one will be removed soon as they are here hiding the works for the multi-stages of the new Mickey's Magical Party show also beginning April 4. There will be small or big stages all around the plaza and this is why you also have palisades in front of the Plaza Gardens restaurant or Casey Corner. But the main stage, surrounded by smaller one is of course located at the center of the plaza. Here is a photo-montage to give you a better idea, click on the panoramic pictures to see it in big size. 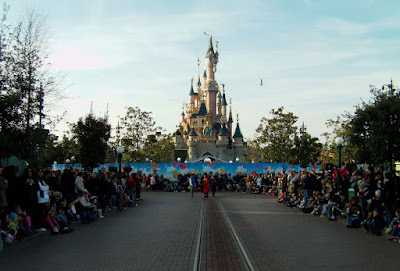 By the way, there was a LOT of guests this week-end in the park - here they are waiting for the late afternoon parade - just as many people as there is usually in July or August, except that we are in the beginning of March. And this is real good news, specially in these times of economy crisis. 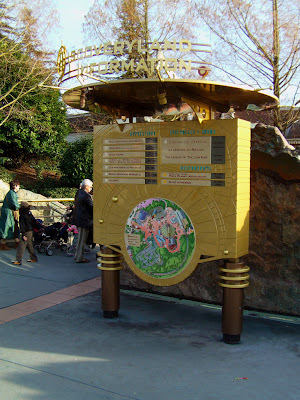 There is no palisades in Discoveryland but there is a nice little addition with this information point, perfectly designed in the "theme" of the land. I've kept the most interesting info for the end. 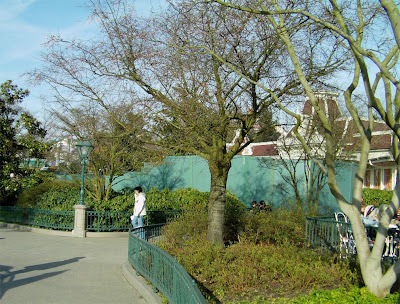 As you can see on the picture below, there is no palisades in front of the Fantasyland Festival Stage, but come back at the end of this year and there should be some all around it as the destruction of the stage is planned by the park for the end of 2009. And why could this be good news? Well, as i've told you before, if the Little Mermaid attraction is build it should be on a land available behind the Fantasyland train station. 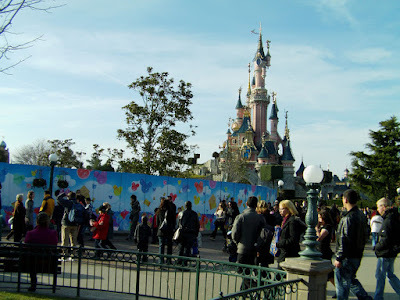 And the first thing they will need to do is....to destroy the Fantasyland Festival Stage which is right in front - and under - the station. So, the beginning of the stage destruction could very well mean that the Little Mermaid attraction is a "go". 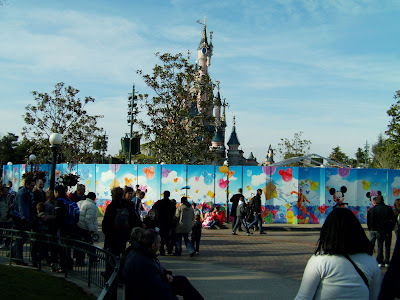 And by the way, the "end of 2009" date for Fantasyland Festival Stage destruction makes perfectly sense in the Little Mermaid construction timing, as the attraction would be the perfect E-ticket for the park 20th anniversary in 2012 and that imagineers need at least two years to build it, exactly the time between the end of this year and 2012. Now, keep in mind that the final decision will depends of the world's economy crisis and its effect on the park. As i've said, people are keep coming at DLP, so so far, so good. But we all know too that the economy crisis is very unfortunately only at its beginning and that it WILL get worst. Which means that any news should be taken with caution until an official announcement....or a new rising of palisades. Big news indeed this destruction of the Fantasy Festival Stage! Never heard of it before, but if this is true, there must be a very good reason behind it, as you say. I don't know of any other projects at this place else than the Little Mermaid dark-ride, so this must be it! That's good news for the 20th birthday, except that it might also mean there won't be anything else. Bye bye Splash Mountain and Indy! I've never heard construction walls referred to palisades before, quite a grand word for a humble visual barrier erected to hide construction work. 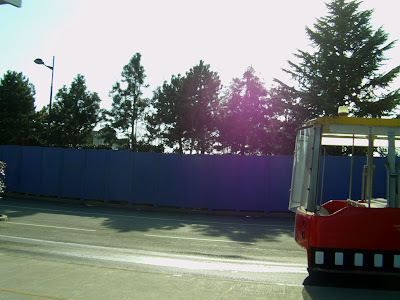 In North America, we just call them walls, check out any photo report online on Disneyland in the off season, they're just called walls. There is so many words in english for that: palisades, fences, walls...that i choose - probably wrongly - the one that i preferred! Great update and photos! 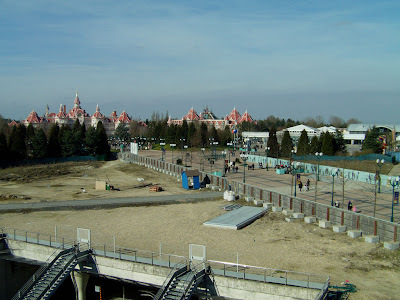 I had my first visit to DLP at the end of January and it's interesting to see what's already changed just since then. One interesting change to me is with the walls, er, palisades surrounding central plaza. I swear those were just plain green or blue when I visited--but they apparently went through the trouble of updating them with the new "magical party" imagery. 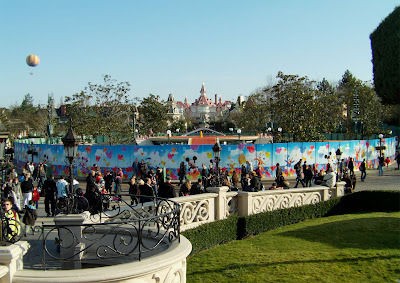 This is funny to me since they will be taking down the walls in just a month. Also--am I reading that Discoverlyand Information sign right? 120 minutes for Space Mountain?? 60 minutes for Buzz? That would be big crowds! Finally--one comment. Bringing the Little Mermaid sounds great, but I wish they wouldn't tear down the theatre to do it. I think it's a very pretty building and there seems to be plenty of room to build it (with an entrance off the Casey Jr./Storybookland path). World's economy crisis has already hit resort hotels. But parks are doing fine! Ok, rather good news, and even quite unexpected! 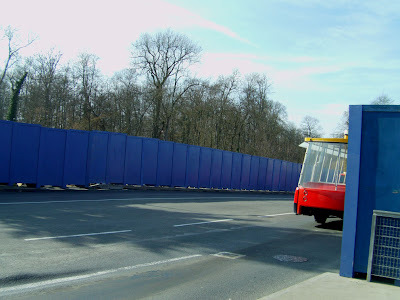 Does anybody know if they are planning to construct another "Festival Stage", like what has been claimed before: on the land that is available behind the berm of that often closed road between Discoveryland and Fantasyland? 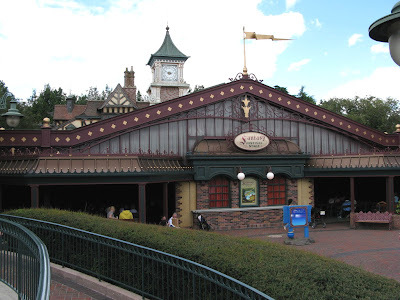 The Little Mermaid ride would be a great addition for Fantasyland, because it lacks some "E-ticketness" and I personally would not mourn about the Fantasyland Festival Stage. - They're also building one at DCA, imagine the savings you can get from that. Alain do you consider the mermaid ride to be a DCA clone or a simplified version? Honestly i don't know if it will be a clone of the one at DCA. I would say that probably it will, but you never know for these kind of details before the official announcement, and sometime even later. 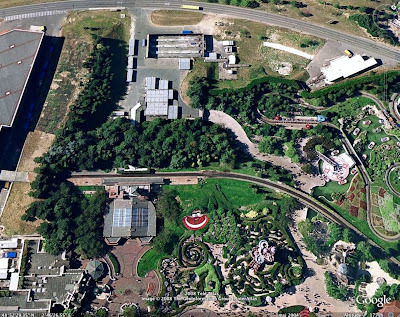 To John321: The land between Fantasyland and Discoveryland was kept at the origin for Toon Town. 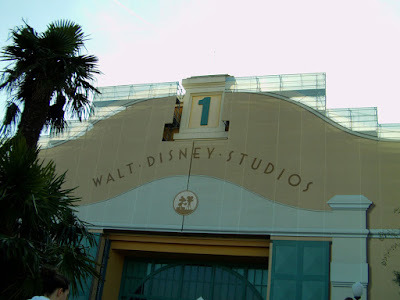 Now that we have a Toon Studio at the WDS i'm not sure at all that they will build it. So, yes the land is available and why not build a theatre there like the one they have in Hong-Kong. But there is no plans that i'm aware of (until now) to build a theatre there. I can't believe I've never left any comments on your blog, so sorry. Anyway, you're doing a wonderful job. It must take a lot of time, but it's worth it, believe me! When "dlrp.fr" (in my opinion: the greatest website on Disney ever created) passed away, I thought I'd never find that kind of quality again! But I was wrong! So thank you, Alain! Pixar release three new posters for UP !